Event monitoring is one of many tools that Salesforce provides to help keep your data secure. It lets you see the granular details of user activity in your organization. We refer to these user activities as events. You can view information about individual events or track trends in events to swiftly identify abnormal behavior and safeguard your company’s data. All these events are stored in event log files. 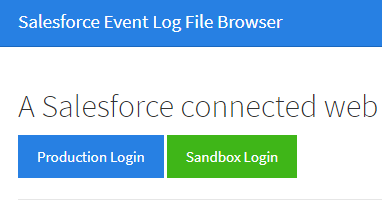 An event log file is generated when an event occurs in your organization and is available to view and download after 24 hours. The event types you can access and how long the files remain available depends on your edition. Developer Edition (DE) organizations have free access to all log types with one-day data retention. Enterprise, Unlimited, and Performance Edition organizations have free access to the login and logout log files with one-day data retention. For an extra cost, you can access all log file types with 30-day data retention. 2. Click Sandbox or Production based on the environment where you want to download.